A superb new illustrated history of skiing in Mount Washington's infamous Tuckerman Ravine. Features more than 160 photographs. The fun and fascinating story of a group of Sandwich, New Hampshire, retirees who took to the paths and peaks of the White Mountains and along the way develoiped a unique community of outdoor enthusiasts. Now On Sale! Very nice signed copy of Book Five in author Katharine Blaisdell's six-volume "Over the River" series of historical books about the Upper Connecticut River Valley in New Hampshire. 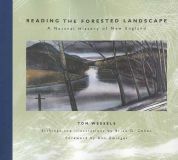 A compelling narrative of the journeys of early American explorers into the White Mountain wilderness. A great new history chronicling the first 100 years of the Randolph Mountain Club, guardians of New Hampshire's Northern Presidential Range. An exceptional historical novel recalling the life of legendary White Mountain pioneer settler Dolly Copp. A photograhic history of Plymouth, gateway to New Hampshire's White Mountains. A photo history of the early rail lines into New Hampshire's White Mountains, and the scenic water bodies that attracted so many early tourists and settlers. 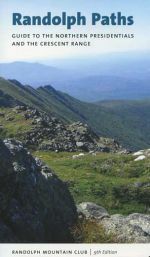 Eighth edition of the popular hiking guide to Northern Presidentials and the Crescent Range in New Hampshire's White Mountains. Sale Priced. Limited quantities available. The new updated ninth edition of the Randolph Mountain Club's invaluable hiking guide to more than 80 footpaths on the Northern Presidentials and Crescent Range in New Hampshire's White Mountains. A great new illustrated retrospective celebrating the first 100 years of the Appalachian Mountain Club's AMC Cold River Camp in the White Mountains. An exceptional collection of 18 true White Mountain stories chronicling notable events and people from the past two centuries.